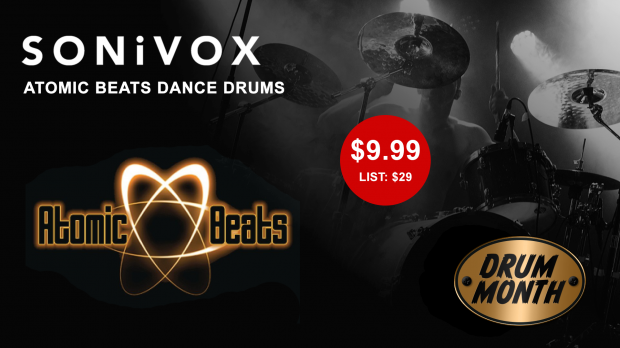 Atomic Beats Dance Drums will turn your next dance track into a earth-shaking, impression-making hit. During ‘Drum Month’ it is on sale over 65% off. Atomic Beats offers the critical building blocks for earth-shaking, impression-making dance. Atomic Beats’ authentic Euro-techno sound is perfect for House, Techno, Industrial and many other forms of Dance. From the slow and low, to chic, to thundering beats- Atomic Beats is the genesis for truly blazing dance tracks. Make your dance projects ATOMIC. This entry was posted in DontCrack, Promotions, Sounds and tagged Atomic Beats Dance Drums, dance tracks, House, Industrial, SONiVOX, Techno. Bookmark the permalink.